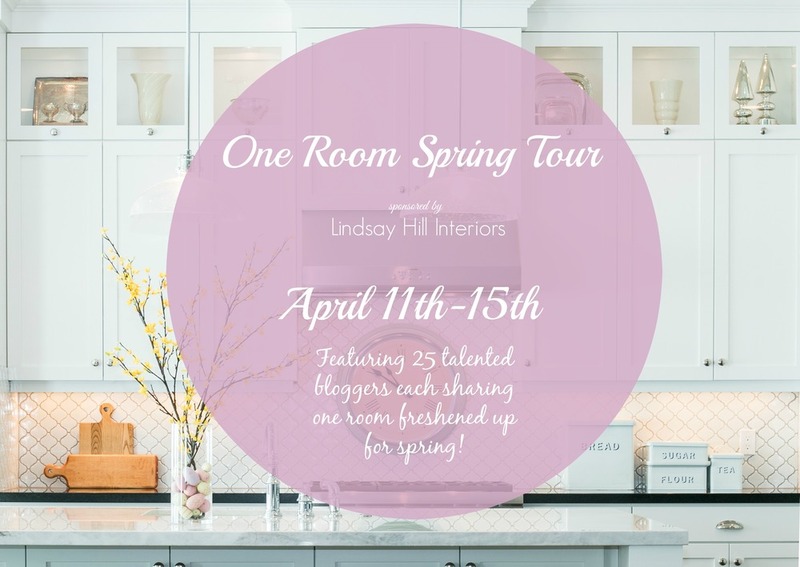 Hello and welcome to the, One Room Spring Tour hosted by Kathleen at Lindsay Hill Interiors! 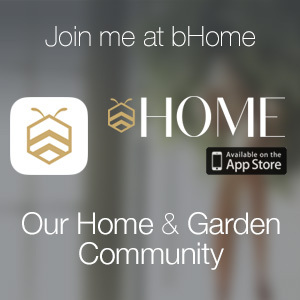 I am joining 25 bloggers as we share one room from each of our homes. 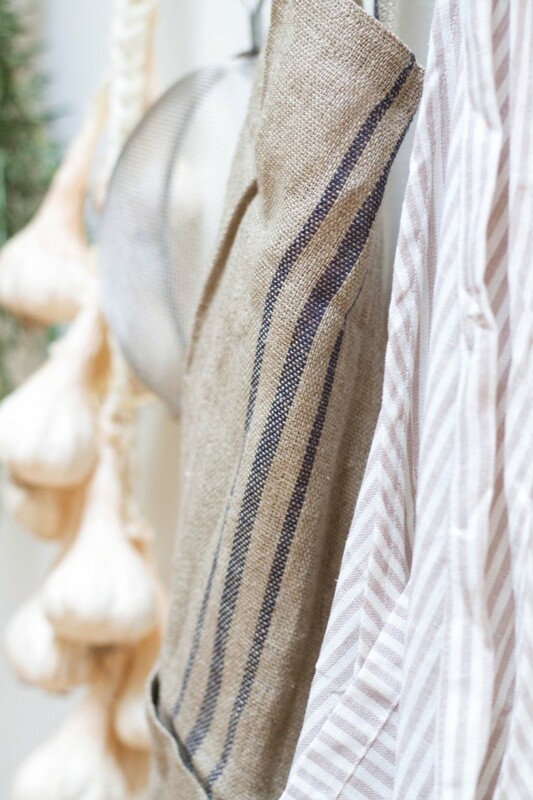 Today 5 of us are sharing our kitchens dressed up for spring. Some of you may be visiting from Brittany over at Duchess of York (the first stop on the tour) and I am so happy to have you here! 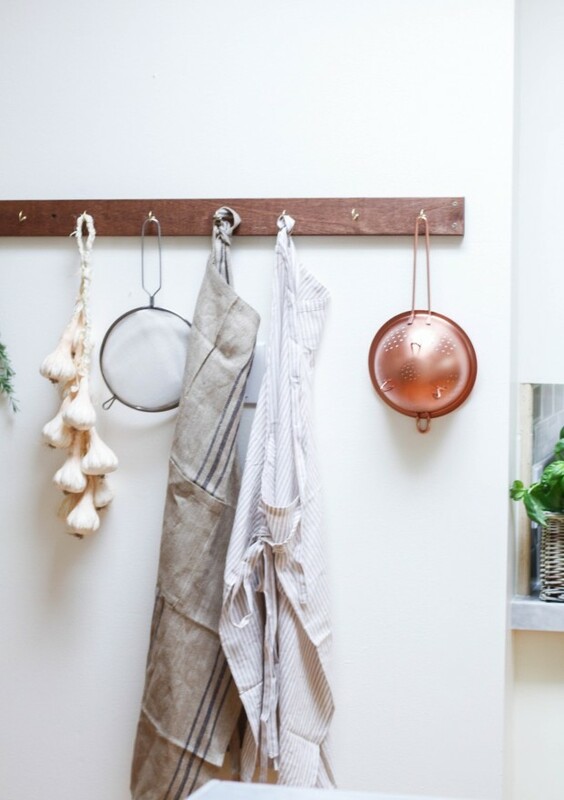 As you enter our kitchen you will see a simple hanging rack I was inspired to make recently. 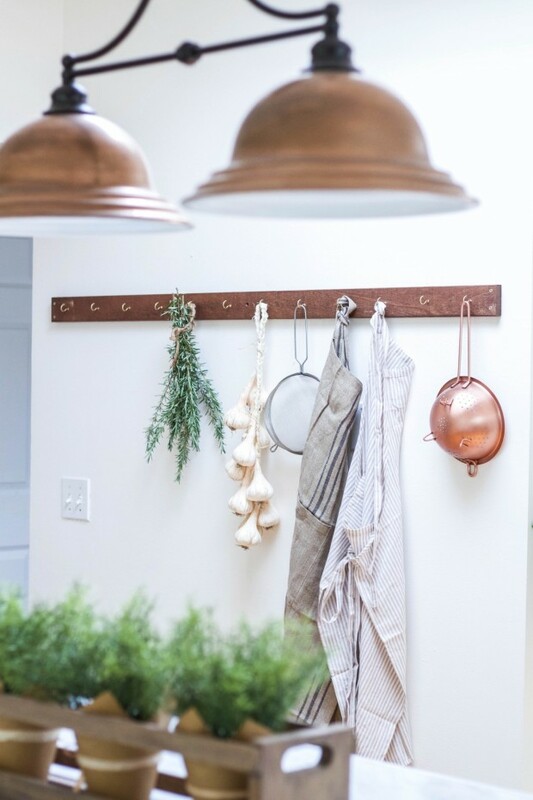 I will be sharing details and a tutorial in the near future… This rack holds all my favorite textures and materials for a kitchen – mixed metals, burlap/linen, plants and most of all wood paired with white. 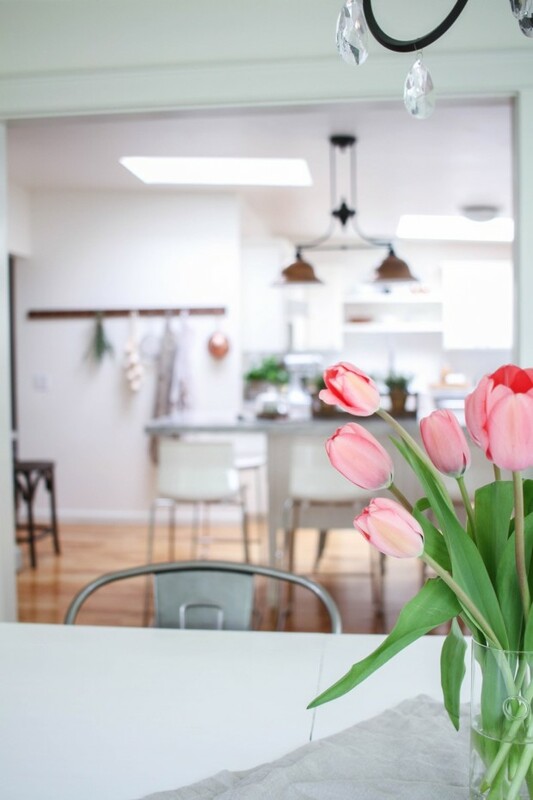 With the arrival of spring, I wanted the kitchen to be a place that would have both beauty and purpose. I love greenery or florals and thought it made most sense to fill the space with those very things, but what could be better than fresh herbs as this is the height of gardening season. 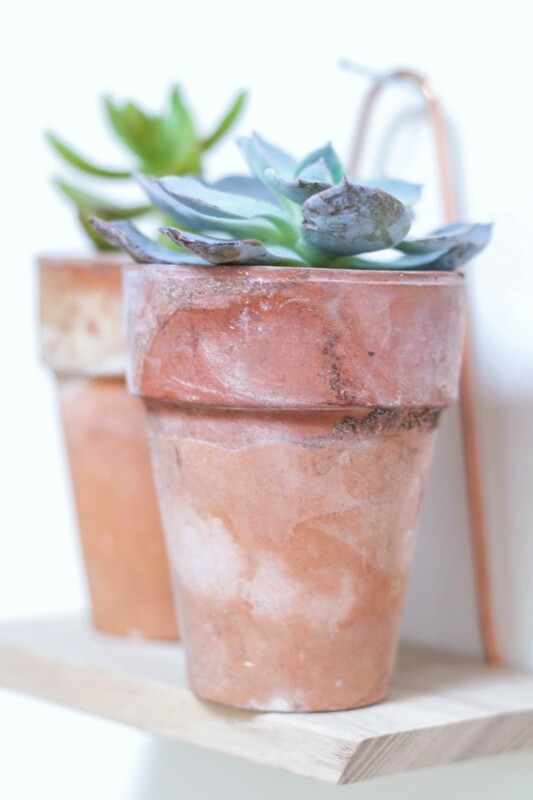 These are plants that can be used for decor or cooking – they serve a dual function. 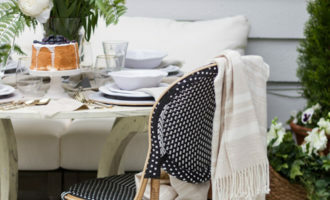 I incorporated bright pops of color through a couple tea towels and left the rest to neutrals, wood tones and bright whites. 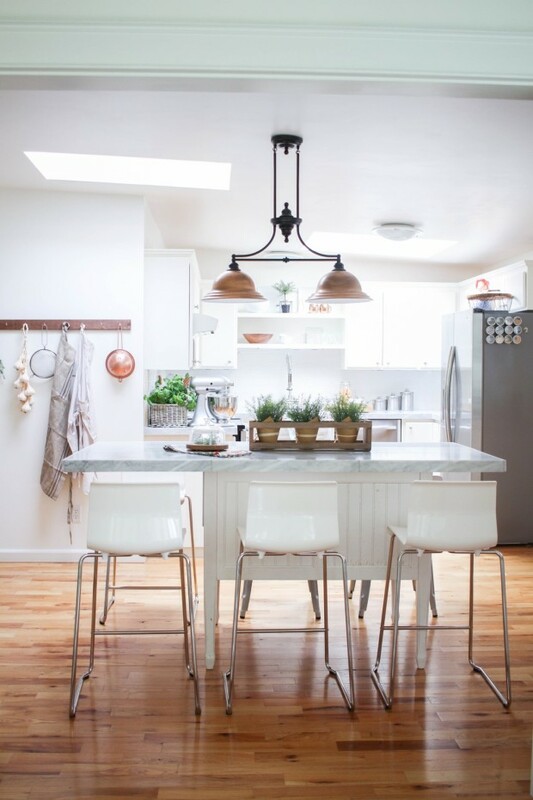 I like my kitchen to feel comfortable and accessible when using the space. 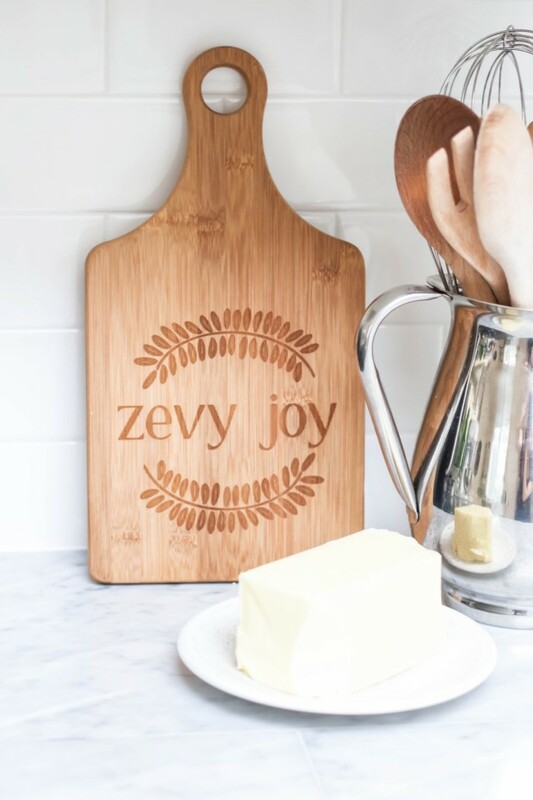 Butter is out, cutting boards and utensils line the counters all while making them easy to grab when necessary. 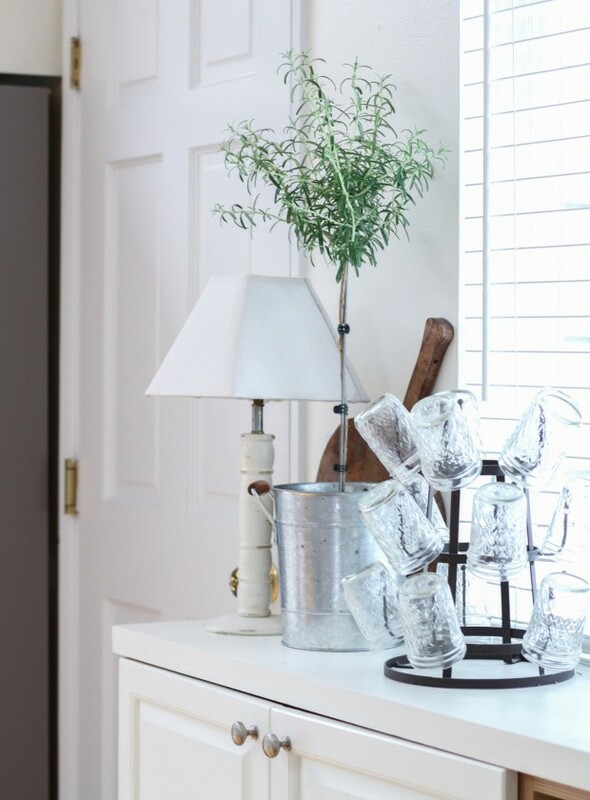 Again you will see fresh rosemary and mason jars out for drinks of water or cold iced tea. 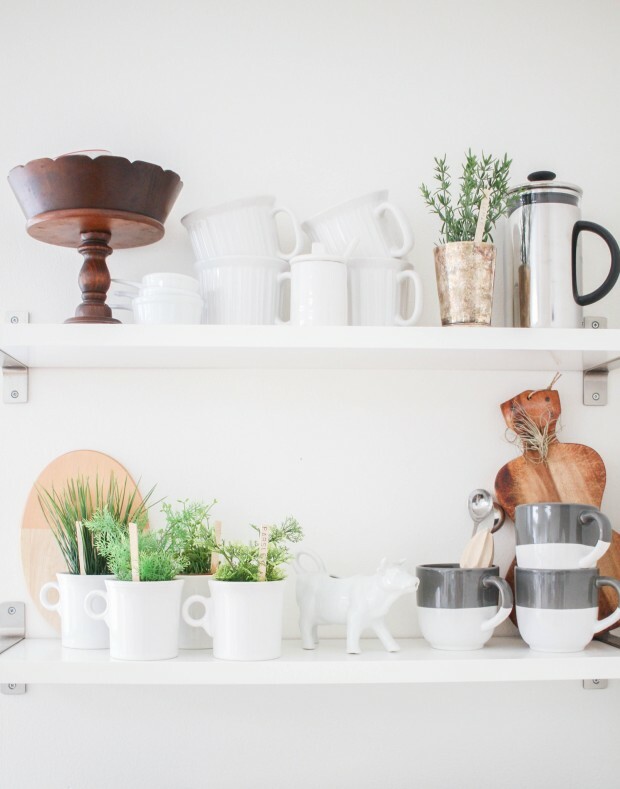 We have some open shelving in the kitchen that houses cups or bowls that are used on a regular basis. In addition, I added some faux herbs to the coffee mugs making them festive for the season. 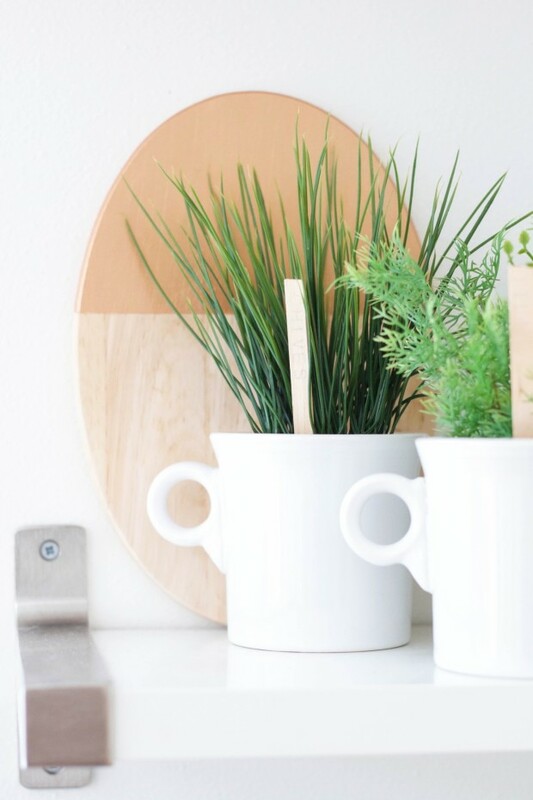 A little touch of green in each area goes a long way. 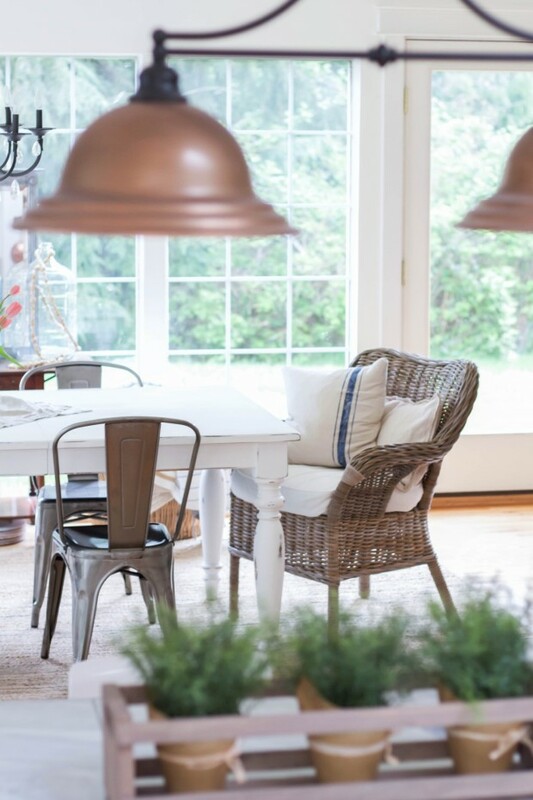 DIY copper lighting hangs above the newly renovated island and you can spy my newest DIY grain sack pillow sitting comfy in our dining area right outside the kitchen area. Here you can see into the kitchen as you peek through the coral tulips that are just about to burst. It is a tiny area with an open plan. 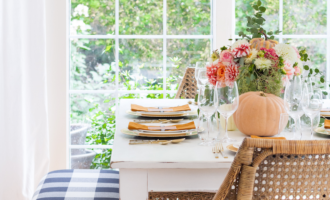 It allows our family to gather for meals and there is an abundance of seating intended for time around the table. 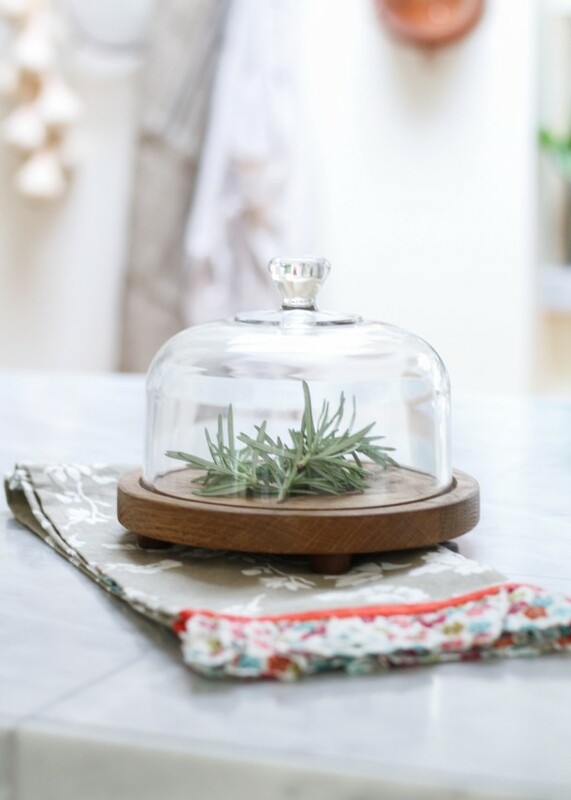 I have taken time finding pieces that are just right for this part of our home. Like this cheese board with glass dome found while thrifting costing me a dollar fifty. Or the counter stools that sit beside the family hutch, each of them totaling 9.99! 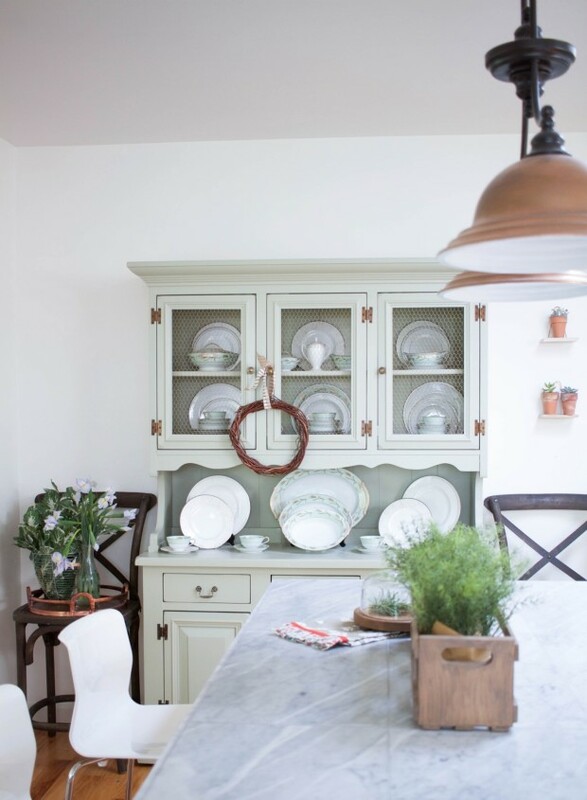 This home has been made with lots of repurposing and thrifting (you can read more about that here). Nothing says spring more than blooming flowers. 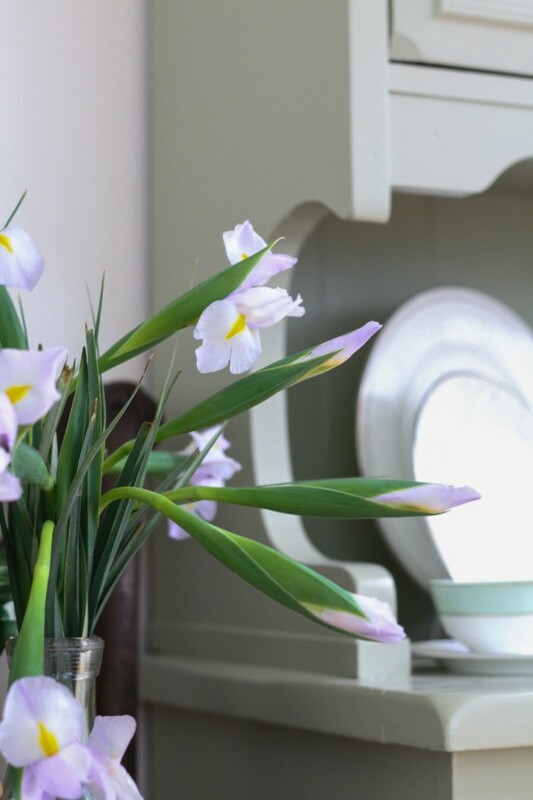 These Iris’ are the prettiest pale blue, even though they look a bit purple here. 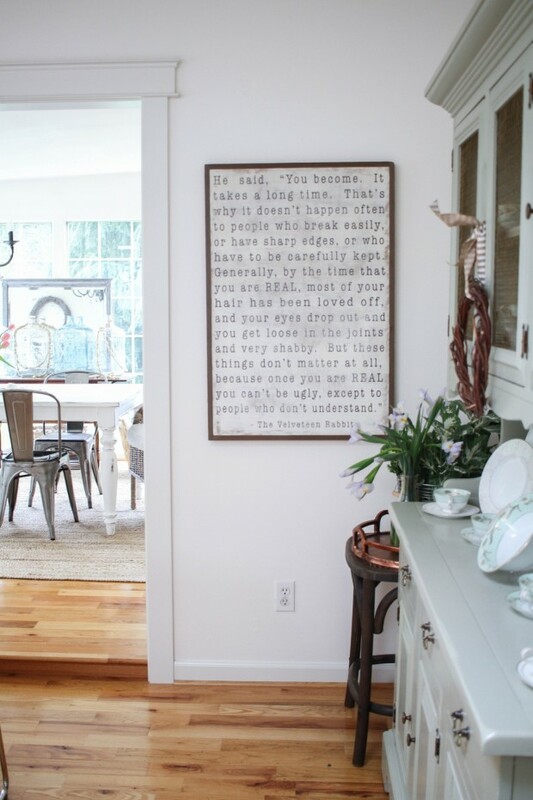 The Velveteen Rabbit lines our walls (sign is from Between You and Me Signs) and sunshine glimmers through the entryways. 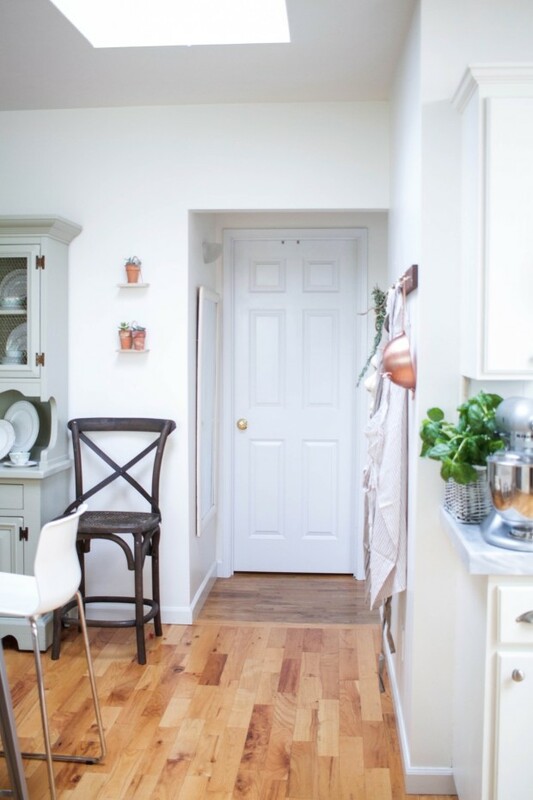 Our kitchen is simple, it is small and it is loved. We worked hard on it through it’s renovation and it is a wonderful spot for our family, one of my favorite. It is not perfect, it has many flaws and most importantly it has character. 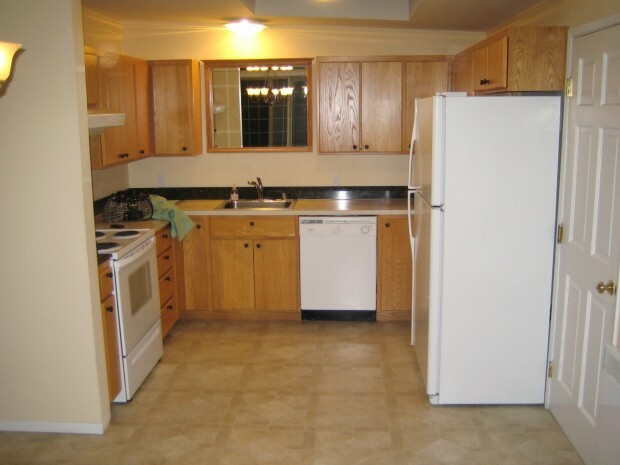 It gives us a place to cook family meals, have special talks about our days and just be together. 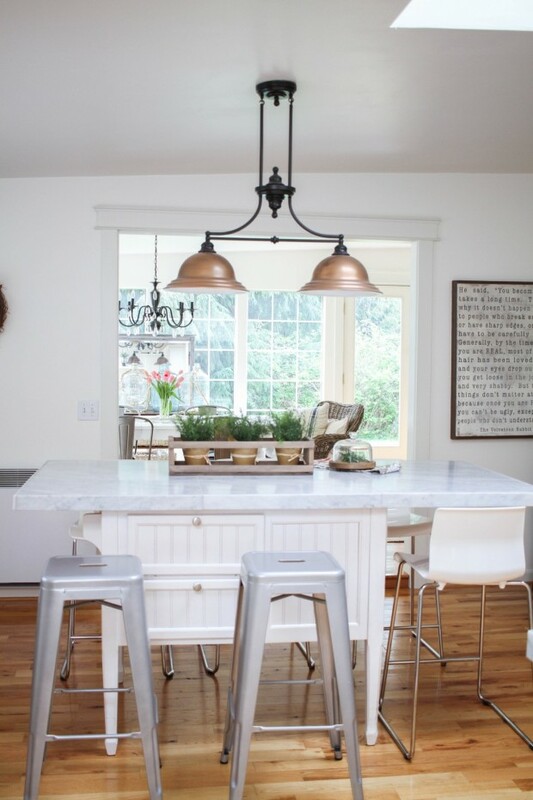 I love what this hardworking kitchen brings to our home and I am honored that I get to share it with you. 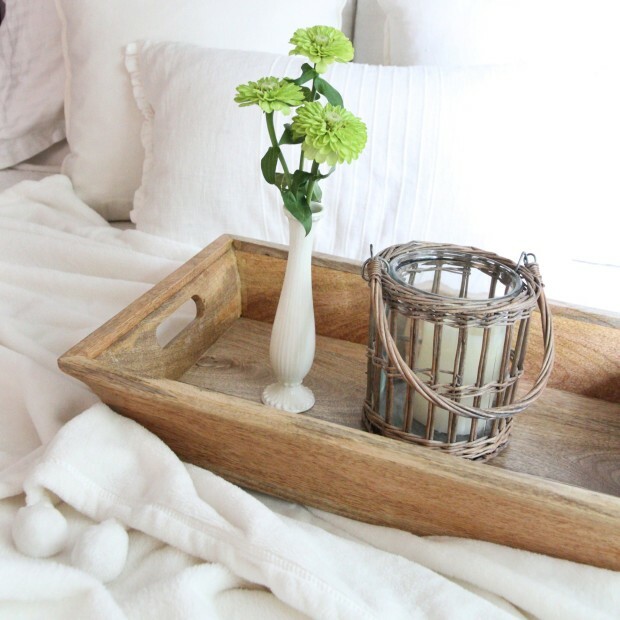 I hope you enjoyed seeing a bit into our place today and are leaving feeling encouraged that decorating can be simple and it can be done creatively on a budget. I hope you will visit again and don’t forget to go to the next stop on the tour! 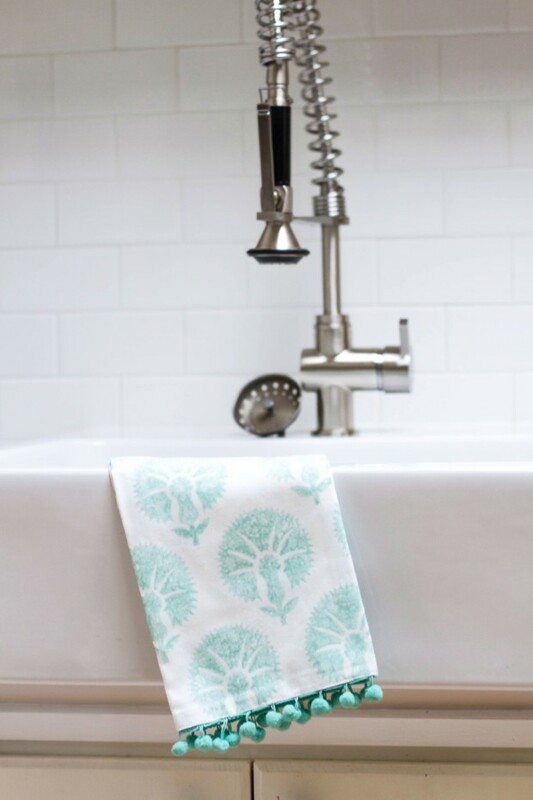 You can head over to the talented ladies, Marg and Liz at Fancy Farmgirls…. A big thank you to Kathleen at Lindsay Hill Interiors and hope you all have a wonderful rest of your week. Kathleen thank you so very much! I am so grateful to have been a part of this talented group and beautiful tour! 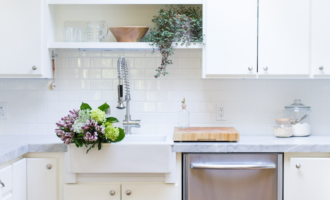 Annie, your kitchen is seriously my dream kitchen! 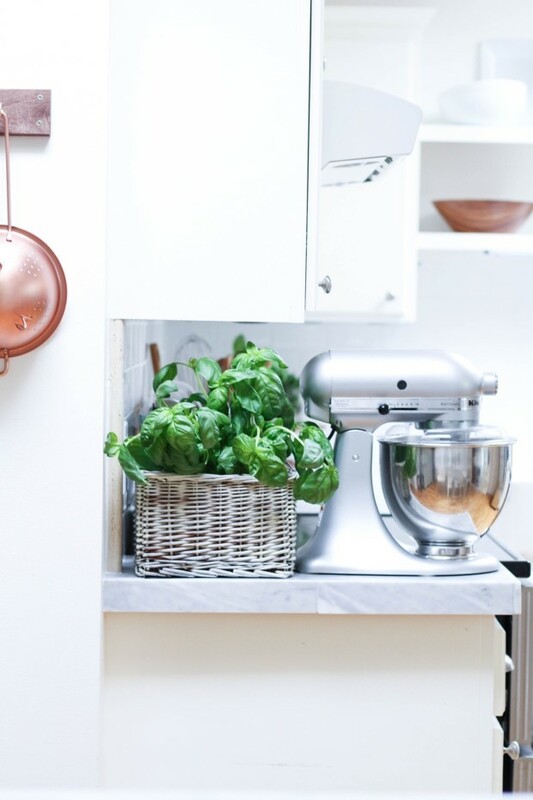 Love how you freshened it up for spring with the herbs and I love, love, love that copper lighting! Kris thank you friend and that is the best compliment. I just love everything you do! Gorgeous Annie! Love the touches of Spring with the greens and flowers. Simply beautiful. Becky thank you very much – I appreciate it! Beautiful Annie!! I love the small changes you’ve made!! Thank you so much Ashley!!! 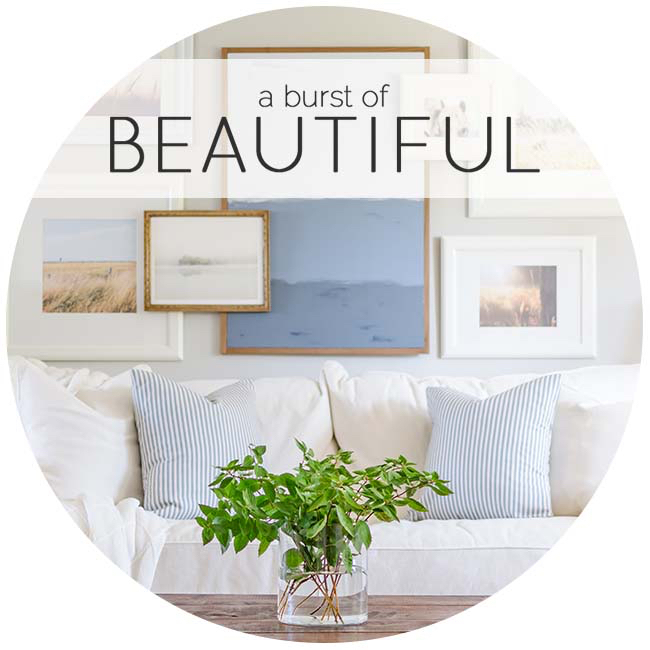 Loved yours as well – it was stunning! Beautiful! 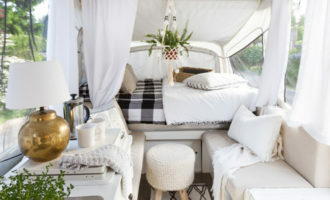 Love your styling ! Oscar thank you so much, I am glad you stopped by! Your tour is stunning Annie! I love your charming style. So well done! Randi, thank you! Charming is what I would hope someone would feel when they would visit so that means a lot you felt that. xo! 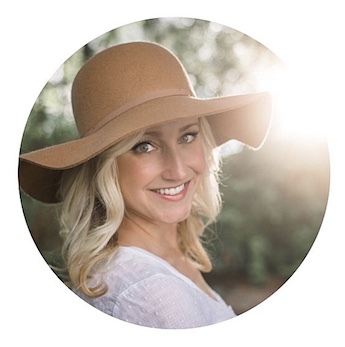 I just found your blog through the Spring Tour and I’m so glad I did! 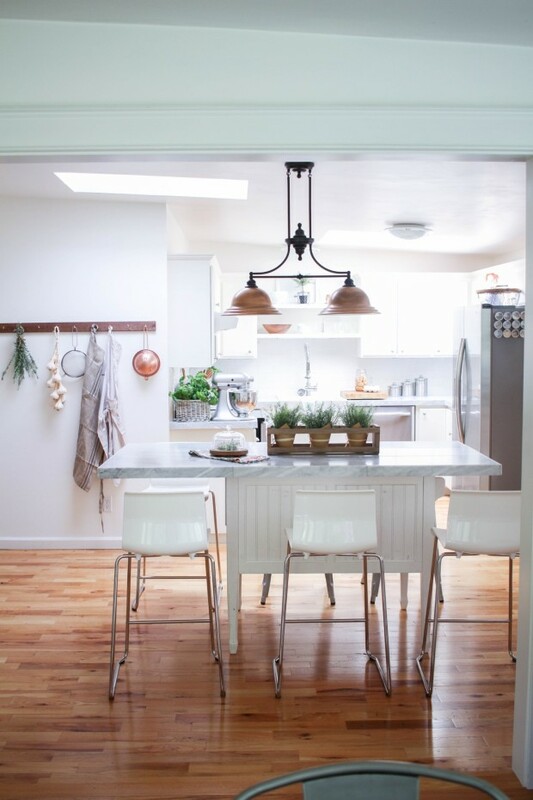 Your kitchen is gorgeous and I love all of the styling touches. 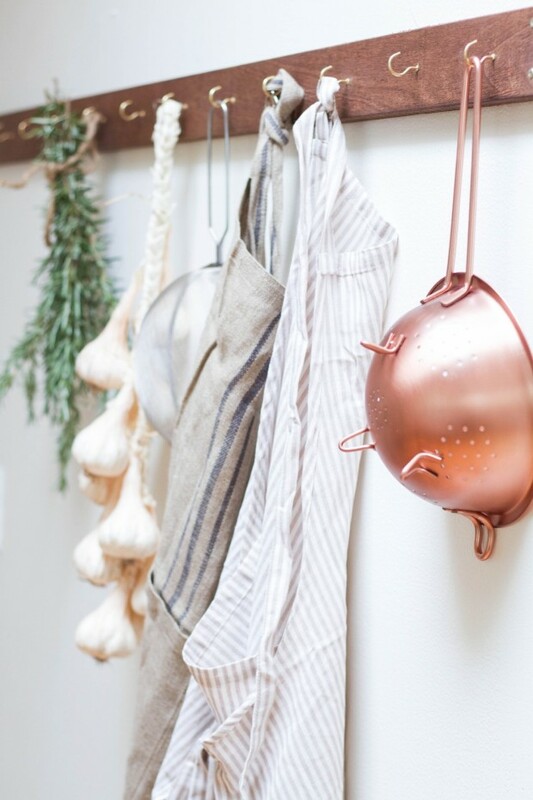 I’m a sucker for those rustic clay pots and I love the simplicity of that hanging rack. Beautiful! Michele, thank you and I am so glad to have you here! Happy to hear you enjoyed the details! Oh Annie!! 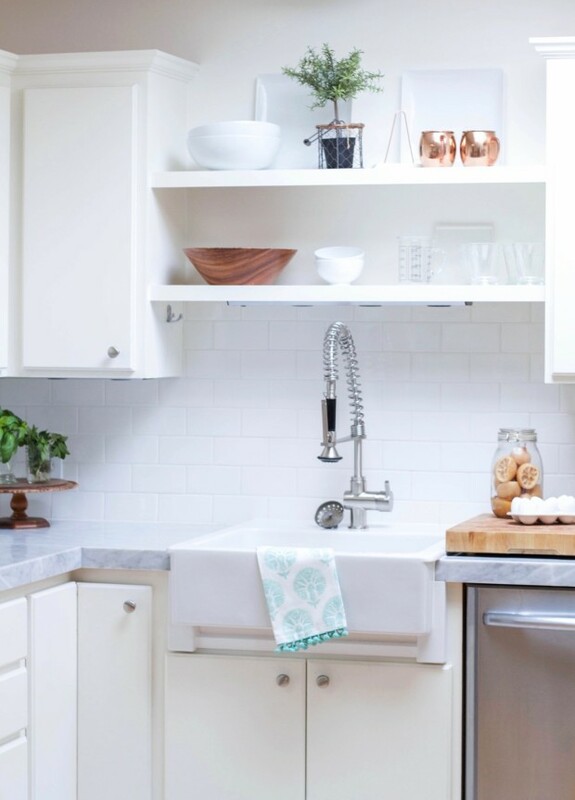 It’s so nice to see your kitchen in BIG pictures. It’s pretty on IG… but this is stunning!! Shannon that is such a compliment friend!!! Thank you for taking the time to visit – xo! !